Mars has expanded its Dove chocolate portfolio with a new selection of flavours which are “inspired by the latest culinary trends”. 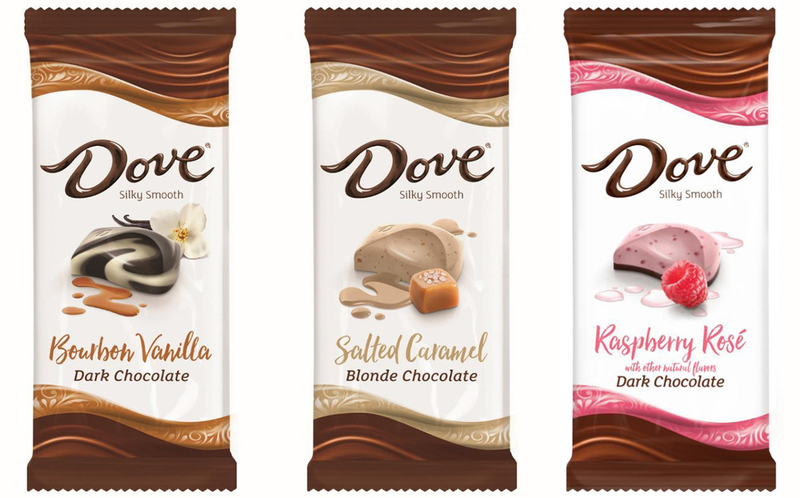 In addition to classic dark chocolate and milk chocolate varieties, the new Dove bars include: bourbon vanilla dark chocolate, salted caramel blonde chocolate, raspberry rosé dark chocolate and almond brittle milk chocolate. Leslie Philipsen, Dove brand director, said: “Our chocolate-loving consumers are always looking to up the ante with their treats. We challenged ourselves to bring creative, culinary-inspired flavours like salted caramel and bourbon vanilla and pair them with our signature silky smooth chocolate. The range will be on sale in the US as of December with a recommended retail price of $1.99 per 3.3oz bar. Earlier this year, Mars launched three new Dove chocolate products featuring cashews and almonds as a response to a consumer demand for more balanced snacks.